Upon review of the past editions of Cuba in Transition, an annual publication of thoughtful articles on the future of Cuban society and economy, one can draw some ideas about how transition in Cuba can or should be played out. Some examples include Loser (1998), Sanguinetty (1998), Tejada (1997), Rivera (1998), but many more can also be found. 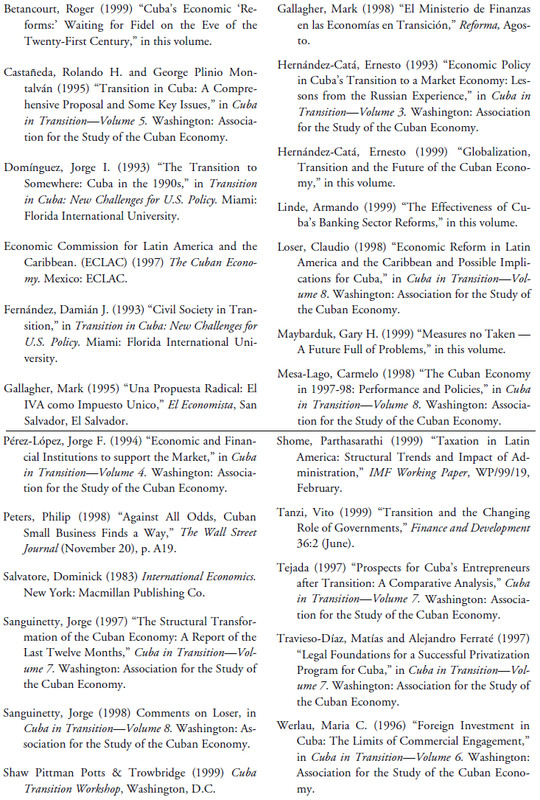 Other sources of published papers on the prospects for Cuban society and its economy during some hopefully not too distant future can be found in other sources, such as the papers presented in the Shaw Pittman (1999) Workshop. This body of literature provides numerous hints at: the structure and nature of the post-Castro society and economy; the macro- and microeconomic policies that should be followed to get the country to its new destination; the social and political changes this transformation may entail; and, the transition problems, in general, that are likely to be encountered. Clearly, we cannot delude ourselves into thinking that there is a clear path ahead. Indeed, Domínguez (1993) lays out nine distinct scenarios that may play out, each of which includes scenarios within scenarios. Transition in the formerly centrally planned economies of Eastern Europe, the Newly Independent States, and elsewhere, has been as varied as the number of countries in question. Nonetheless, there are a number of findings that can be drawn from these other experiences, which when combined with the thinking on the Cuban transition already mentioned, can help to discern some feasible transition paths for Cuba. Much attention has been paid to the monetary and exchange regimes, the broad macroeconomic policies of fiscal balance and stability, and to issues related to privatization, yet little attention has been devoted to specific tax policy for the Cuban transition.2 Indeed, Castañeda (1993) lays out a far reaching agenda for stabilization and economy-wide structural reforms, yet he does not even touch upon matters of taxation. World Bank (1996) illustrates how in the movement from a centrally planned economy to market systems almost all the countries involved have experienced rapid declines in their tax revenues. Reasons for this decline include some of the concepts already mentioned, such as loss of access to public enterprise profits, loss of turnover receipts, and a lack of institutional capacity to impose taxes on private market businesses. The immediate movement to more modern concepts of taxation, such as corporate and personal income taxes, was usually disastrous as accounting standards, administrative capabilities, and legal frameworks had not yet been established. Tax revenues in Cuba have come mainly from turnover taxes collected from public enterprises, transfer of profits from public enterprises, social security contributions, and implicit taxation of foreign currency. A free-market, private sector-led new economic program would leave the government bankrupt unless it completely overhauls its revenue system. Experience elsewhere has shown that transition must be led by a strong, reformist government. The classic example of where this has not been the case is Russia, where the tax system has not developed and this has been the root of fiscal morass, monetary chaos, and continuing economic decline. For transition in Cuba to mature, an appropriate tax system that will generate adequate revenues while causing as little damage to nascent private sector activity must be developed. The set of streamlined characteristics below forms the basis of an assumed economy in transition in search of an appropriate tax system. This set of characterizations is based on the collective wisdom found in the various volumes of Cuba in Transition and the experiences of other centrally planned economies. Judgment is tempered considerably by the fact that, in a relative sense, Cuba, prior to the revolution and continuing into today, could as easily been classified a developing country as a centrally planned one. Clearly, Cuba is not, and was not, just any developing country. Social indicators were high in the 1950s and remain high today. Similar to the other centrally planned economies, human capital is fairly well developed, yet misdirected, especially in the areas of management, administration, public administration, and economics. What Cuba has in common with developing countries today is an extremely low level of income per capita. In addition, the Cuban economy is much more dependent on the agricultural sector than were the other centrally planned economies, as industrialization never quite took off. By definition, transition means that Cuba will move to a market-oriented, free society. An important issue is whether the transition in Cuba will be peaceful or violent. Will it result from a coup d’etat or from turnover by the current authorities after peaceful and fair elections? What will be the role of foreign or exile participation in the transition? Will there be piecemeal movement toward market mechanisms without concomitant political liberalization—say the “China” option — or will we have a big bang approach to economic liberalization? Clearly, these issues are of paramount importance to the welfare of Cubans, and we can only hope for the smoothest, most peaceful of transitions. Recommendations for achieving this have been made elsewhere. Whether these are adhered to and successful, only time will tell. Regardless of how the transition takes place, it is a basic assumption of this paper that sooner or later the country will move toward broad economic liberalization. Once that begins, a new set of problems arises for maintaining the public coffers. This paper focuses on how to address these problems. 1. A peaceful transition and move to a free market economy will be accompanied by the removal of the U.S. trade and investment embargo. This does not require much explanation. The U.S. embargo exists because of U.S. opposition to the current Castroist system. Clearly, a peaceful movement to a democratic and market-oriented system will be rewarded by an opening up by the United States. At the same time, there is no reason to expect that merely good intentions and the removal of the U.S. embargo will necessarily lead to vast inflows of capital from the U.S. and vast outflows of exports to the U.S. Obviously, the more peaceful the transition and the more quickly the institutions of free market economics are established the more quickly we can expect economic ties to develop and deepen. 2. There will be little trust of government and the “rule of law” will be extremely weak. After four decades of authoritarian rule, it is unlikely that a new government committed to reform will be able in all instances to win the hearts and minds of Cubans. Throughout the world there is considerable skepticism of government. In Cuba this is likely to be heightened. Under Castro, the rule of law and the politics of power were never quite separate. Indeed, they have been closely intertwined. This leads to a judicial systems whose outcomes cannot be predicted or trusted. A quick changeover to a democratic Cuba is unlikely to result in a complete and immediate revamping of the judicial system, and confidence will lag even further. Fernández (1993) asserts that civil society is Cuba has never been passive and in the 1990s, Cuba has become “increasingly difficult to govern,” and that the “schism between the state and the society seems to be widening.” Indeed, Fernández predicts that any transition government will continue to face such a schism. 3. There will be an urgent need for revenue. Fiscal and macroeconomic balance will be high priorities in transition. One of the most important lessons we can draw from the Russian transition is the need to maintain fiscal balances. Printing of money and lack of financial control has led to wild gyrations in the financial system, the payment of debt, and the value of the domestic currency. The same could happen to Cuba if close attention is not paid to the fiscal system. The Government of Cuba has been responsible for providing most social services, such as education and health care, to the country’s population. Merely declaring the country to be free and market-oriented will not reduce the dependency of Cubans on these state services. For the interim, the Cuban government will continue providing these services, and they must be funded. 4. There will be a sell-off of a large number of state enterprises. Mass privatization, whether executed slowly or rapidly, will be part of the very essence of the movement toward a free market system. Some of the public enterprises may simply be shut down and their employees laid off. ECLAC (1997) figures show industrial production and efficiency on steep declines throughout the first half of the 1990s, i.e., during the “Special Period.” While these declines seem to have leveled off, they result in employment in many industries being at half the 1990 levels. With the opening up of the economy to international and domestic competition, combined with the inability or unwillingness of the government to continue to subsidize inefficient industry, we can expect some of these firms to fail. 5. There will be a proliferation of many small and microenterprises. At present, according to Peters (1998), about three-fourths of formal employment in Cuba is in the public sector. Regardless of the pace of privatization and the realignment of the economy toward a market economy, we can expect rather great displacements of people. This will not only entail people moving from public sector to private sector employment when their enterprises are privatized, but also streamlining, downsizing, and greater reliance on outsourcing. The closing of uncompetitive enterprises will also cause great shifts of employment from large but unwieldy firms to smaller companies. CEPAL (1998) estimates unemployment in the mid- 1990s at around 30 percent of the labor force. Without going into the causes and prospects for formal sector unemployment at this time, it is almost certain that such unemployment can only survive if subsidized, say from public provision of social services, subsidized food and shelter, and family support. With the move to a market economy we can expect two things to happen: (1) decline in these subsidies, and (2) expansion of opportunities, at least the reduction of legal barriers, for self-employment. In recent years, despite discriminatory tax policies and social disrespect, there has been a surge in selfemployment and small business formation. With the move to the market economy and the inherent greater prestige that is likely to be afforded the new entrepreneurs, we should expect a proliferation of small businesses. Peters (1998) is optimistic about the contribution small businesses can make to Cuba’s economic life. He points out that based on a survey he helped conduct, the self-employed—who numbered about 150,00 three years after the reform that encouraged their formation — earn about three times the average Cuban salary. Peters points out how other reforms have created the bustling farmers’ market and that, should more reforms come about, we can expect small businesses to be at the forefront of economic recovery. 6. The country will have a relatively large foreign trade sector. During the pre-1990 period, before the fall of the Berlin Wall and the loss of Russian subsidies, the Cuban economy was highly open to the importation of foreign produced products. During the final years of the 1980s, Cuba’s imports were equivalent to about 30 percent of GDP. After the loss of the Russian subsidies, the ability to import declined drastically. Indeed, in 1992 imports only came to about 5 percent of GDP. Imports have recuperated only slightly, and by 1996 were still below 15 percent of GDP. It is likely that the Cuban economy in transition will rapidly expand its trade sector.4 Foreign assistance and foreign investment to rehabilitate existing plant and infrastructure, to make greater investment in the tourist sector, and to undertake other new investment, will be highly dependent on the importation of foreign capital equipment. Local labor employed in these rehabilitation works will spend much of their earnings on foreign produced consumer goods, including food. ECLAC (1997) talks about the country’s need to rebuild its foreign trade sector, including the promotion of exports. This will include reinvestment and rehabilitation of the sugar sector. Tourism seems to be a sector with favorable prospects and will likely generate considerable foreign exchange. Another source of foreign exchange for Cuba has been remittances. While it is not clear how much these have totaled, indeed, there is quite a bit of disagreement, there does seem to be some consensus that remittances have been large. It is unlikely that remittances will decline with transition, and may actually rise. These remittances will provide increased wherewithal to pay for imported consumer goods. 8. Information systems and standards, such as those in government, in private sector accounting, financial system accounts will be rather primitive. The country’s banking sector is quite primitive and will be quite weak during transition. With little financial deepening and little use of personal and business banking accounts, money trails will be hard to trace. There is little personal credit, which again is an important source of financial information in market economies. 9. Large inflows of foreign assistance are expected, or at least hoped for. We can expect a peaceful transition to democracy to be aided with foreign assistance from the United States. Foreign aid flows from Europe and Japan will also surge. These foreign aid flows will likely be both in project terms to pay for infrastructure rehabilitation and new investment and to pay for technical assistance. There will also be general balance of payments and budget support to ensure some degree of stability in international accounts and domestic balances, keep inflation down and finance the much needed importation of both capital and consumer goods. Given the trends in Cuba’s exports over the recent past, such foreign assistance is sorely needed. Depending on how the transition takes place, foreign investment may grow quite rapidly, especially coming from the U.S. given that it now does not exist, at all. 10. There will be a proliferation of Non-Governmental Organizations (NGOs), especially to participate in the country’s foreign aid bonanza. U.S. foreign assistance over the past fifteen years has been very much favoring the support of “civil society” and the use of Private Voluntary NGOs as partners in the development process. The chase after foreign assistance grants has led to a proliferation of NGOs in all the countries where U.S. assistance has been important (except, say Israel). The importance of mentioning this likely matter is that NGOs, with foreign donor support, will seek, and likely gain, tax and duty free status. The greater the share of economic activity undertaken by NGOs the more difficult it will be to collect taxes on imports and on domestic consumption of goods and services. Obviously, this list of streamlined characterizations does little justice to all the changes that will be taking place during Cuba’s transition. Yet, it is hoped that this list is both accurate and of particular relevance to the fiscal challenges that the country is likely to face. Experience has shown that revenue systems in centrally planned economies work very differently than they do in free market economies. The major reason for this is that in the centrally planned economies, revenues are mainly generated by payments or transfers from the public enterprises to the central government. In a free-market economy, the government must rely on coercive taxation, meaning that measures must be in place to ensure compliance. Such measures include, inter alia, information systems, a justice system that is considered to be fair and wellfunctioning, policies that create minimal economic distortions, and a tax administration that is capable of carrying out sophisticated audits of firms and individuals. Tax and customs administration must not only be capable but must also be honest and accountable for its actions. Punishment for tax evasion and of corrupt officials must be likely, swift, and fair. During transition most of these conditions for a freemarket oriented tax system will not prevail. The breakdown of central political and administrative control could lead to increased opportunism among government officials, including tax and customs administrators. Poor information systems and the proliferation of small businesses, coupled with the collapse of many of the country’s larger, industrial firms, will make it very difficult to implant modern tax systems. The ability to audit these firms by tax administrators, to root out tax evasion, squelch collusion with tax authorities, and force compliance will be severely restricted. We could investigate the feasibility of establishing an independent tax authority, similar to that in many other countries, such as Peru, Guatemala, Uganda, yet this is not going to affect the basic fundamental weaknesses discussed here. What is needed for the transition is a tax system that will be adequate for immediate needs but which can serve as the basic building blocks toward a free-market Cuba after transition. This means that we need taxes that rely little on broad-based information systems, require little in the way of audit, can be easily monitored, are not subject to sophisticated analysis, have built-in self-enforcing mechanisms, and can eventually serve as useful mechanisms of the freemarket economy. This means that movement from the transition tax system to a more permanent one should be smooth and not encumbered by entrenching bureaucracy, administrative systems, and the development of new interest groups, i.e., those arising from the new structure of taxation, itself. This transition tax system should form the basis of the segue into to the new, modern, market-oriented tax system. The transition tax system, likely every tax system, will cause economic distortions. To the extent possible, these distortions should be held to a minimum. It should be kept in mind, however, that there will be a definite trade-off between distortionary policies and administrative feasibility and compliance. • Excises on tobacco products, liquor, beer, and hydrocarbons. • Royalties on natural resource extraction. While this is a normal set of taxes, the emphasis and timing during the transition process are of great importance. It is also important to point out here that the property tax is not recommended. Each of these taxes is discussed below. Given the expected relatively large share of the trade sector in the Cuban economy, imports should make a rather strong tax base. Given the poor information systems and the few ports in the country, imports make for an excellent tax handle, i.e., this will be a relatively simple tax to collect. Customs taxation does not require sophisticated administrative systems nor a high degree of adherence to the rule of law, since taxpayers simply will not be allowed to remove their goods from customs until they pay the taxes due. At the same time, a simplified customs duty schedule, especially if only one, unified rate is charged could greatly reduce the opportunities and pay-offs to fraud and corruption. Tariff simplification not only reduces economic distortion but also contributes to transparency and the rule of law. Excises: Taxes on beer, tobacco products, and spirits have two major advantages in developing countries, in general, and in the Cuban situation in particular: ease of collection and externalities related to health effects. These taxes are easy to collect. They are collected at the factory or distillery, and are based on volumes rather than values. Being based on volumes and collected at the few factories in the country producing alcoholic beverages or tobacco products, there is little need for sophisticated information systems or intensive audits. This is not to say that there is no need to maintain vigilance, but it is much simpler than taxes based on business accounts, such as a tax on profits. The excise on hydrocarbons should be placed either on the import of finished products, such as gasoline, diesel or bunker for electricity generation, or on the output of domestic refineries. This tax would have two benefits in the Cuban context: much like the other excises, it is simple to administer, and the negative externalities of hydrocarbon use, such as air pollution, would be internalized, raising net economic welfare. The fact that this tax would be placed only at either the point of importation or at the refinery means that we could impose the tax in quantity terms and not be dependent on sophisticated accounting and audit systems. In some countries, excises are used both to generate fiscal revenues while also discriminating against foreign production. It is important that excises be applied evenly to both domestic and imported product, although exported products should not be subject to the tax. Value-Added Tax (VAT): Initially, VAT will not likely be a major revenue contributor. After a few years of reform, it should probably become the most important revenue source for the transition government. Once most public enterprises are privatized, and the private sector begins to lead investment and become the motor of economic growth, VAT revenues could form the single greatest revenue source for government. Whereas in some developing countries the VAT is already an important source of revenues, in many postcommunist transition countries, VAT revenues have developed slowly. This is because VAT is usually only applied to larger firms, since the expenses of collecting and enforcing VAT for small firms is not worthwhile. Hence, the large parastatals of today will be the major contributors of VAT revenues in the future. The many small firms that we can expect to develop as part of the transition process are not likely to be direct contributors to VAT. In order to ensure the VAT is well managed, it is recommended that the threshold for firms to participate be set at a relatively high level. Perhaps in the first few years the number of VAT-paying firms would be only a few thousand. Meanwhile, small firms, such as corner grocery stores, street vendors, small restaurants, should not be required to be included in the formal VAT system. Instead, they should be assessed annually and made to pay a simplified substitute tax, such as a fixed fee (cuota fija). This would allow authorities to use their limited human and technological capabilities in the best way, focusing on larger, more productive taxpayers. • Have as few exemptions as possible. • Have a relatively high minimum firm size for the first few years of transition. This can be reduced or held constant as administrative capacity and economic development proceed. • Do not allow fiscal credits to be issued by restaurants. This is a great source of abuse in developing countries. • Allow fiscal credits from grocers only when issued to restaurants or hotels. • Develop a special regime for small firms. • Make sure that refunds are credited to exporters in a very short time. • Make sure that refunds for capital goods purchases or imports are credited in a reasonable time frame, and that large capital purchases are given special treatment. Corporate Income Tax: There are a number of negative aspects of corporate income taxes. They are difficult to enforce when there are many small firms, rule of law is weak, accounting standards are not established, and information is hard to come by. Combine these disadvantages with the weak administrative capacity we are likely to experience in the transition Cuba, and one is almost convinced that perhaps this would be a tax that should just not be imposed. There is one very important reason for imposing the corporate income tax, however. Foreign investment is likely to be rather important, or at least we hope it will be. American and European tax laws treat overseas investment in a “tax neutral” manner. For instance, the U.S. corporate tax is based on worldwide income, with corporate income tax paid in foreign countries creating tax credits (up to a certain limit). This means that if a U.S. firm pays $100 in income tax to the host government where it has foreign operations, its tax bill to the U.S. Internal Revenue Service (IRS) is reduced by $100. Should the host government not impose any corporate tax, then there is no tax credit generated in the U.S. tax code and the firm must pay the amount to the IRS. Hence, by not having a corporate income tax Cuba would forego revenues, U.S. firm would not be worse off or better off, and the IRS would be $100 richer. Why let this money go to the home government of the foreign investor when it could go to the Cuban government without providing any disincentives to foreign investment? • There should be only one corporate tax rate. • There should be no zero income tax bracket. • The corporate tax rate should not exceed the top marginal tax on personal income tax. • Corporations should be required to report on and withhold personal income tax from dividends paid. • Depreciation rates should be uniform by asset class rather than be based on specific industry..
• Corporations should be required to make anticipated payment of taxes. These anticipated payments should be a fixed percentage of gross, monthly revenues. • All corporations should be subject to the same corporate tax. There should be no exemptions. Personal Income Tax: Politicians are likely to push for a personal income tax mainly because it gives the appearance of being progressive, taxing the rich and leaving the poor with the little they have. Experience in many developing countries belies this basic tenet.7 Usually, the personal income tax is paid mainly by formal sector workers. The ease of withholding taxes from salaries makes this tax an easy source of revenue. Yet, the difficulties with taxing workers and owners of small businesses, who often may earn rather high incomes, combined with the ability of wealthy people to evade and avoid taxation through legal and illegal means, makes this a tax that usually falls on a rather limited segment of society. This small segment of society is the formal sector workers, who are not likely to be the wealthy sector. Lack of information, weak administration, considerable incentives to bribe or look the other way, and an ability to disguise income as benefits or business costs, make the personal income tax a very difficult tax to impose fairly. Yet, we recommend the tax for the transition for mainly two reasons. First, if there is going to be a corporate income tax then there must be a personal income tax. Otherwise, the tax system would discourage the corporate form of business and would encourage other business forms that might not be as desirable. Second, starting a personal income tax during transition should help to establish the groundwork for the eventual more modern economy that should have this type of tax. • There should be few rates. • There should be few exemptions. • The zero rate should be high enough to ensure that not too many people are caught in the net. • Withholding on salaries, interest earnings and dividends should be instituted. • It might make sense to make dividend earnings deductible, or even a credit, from personal income tax to avoid double taxation. • Personal income tax should be paid by all residents of Cuba. • Income derived in Cuba or from outside Cuba should be subject to the personal income tax. • All income should be taxed the same, regardless of its source. Royalties on Natural Resource Extraction: Royalties, particularly on non-renewable resources such as nickel and other minerals, can be an important revenue source and can inject some rationality into resource exploitation. Without appropriate royalties, the resources of the country will be over-exploited, depleting reserves without having left much to show for future generations. Reliance on import duties can cause some difficulty in expanding the country’s exports. Hence, it is important that some form of duty drawback system be developed to help mitigate the tax on imported inputs. This system should be simple, enforceable, and subject to close monitoring. Drawback systems are often subject to considerable fraud. Often governments attempt to minimize this fraud by imposing severe monitoring and evaluation of exports by the customs service. This can lead to high costs imposed on exporters and to collusion and corruption. Simple methodologies exist in other countries and should be investigated for their applicability to Cuba. For firms that wish to physically locate in Cuba for the sole purpose of assembly (maquiladora), it might make sense to establish free zones or special duty free zones (recintos fiscales) where they could bring in raw material without paying import duties. However, firms located in these zones and employees working in these zones should be subject to income taxes. They would not be subject to VAT on their exports and would not be required to pay VAT on their imports. For firms that both produce for domestic and export markets, the free zone might not be the ideal situation since this could lead to serious accounting, audit and compliance problems. Tourism seems to be the one hopeful economic sector of the Cuban economy at this time. Recent performance has shown this to be the most dynamic sector and the sector likely to both attract continuing inflows of foreign investment and to generate needed foreign exchange. In discussions with some colleagues it seemed that it would make sense to impose a special tax on tourism. I have refrained from such a recommendation. There are reasons why I do not suggest special tourism taxes, although future studies might be undertaken to suggest that perhaps this sector should be taxed in a specific way. The tourism sector should be taxed as any other economic, non-rent based, sector. Therefore, a VAT on consumption, whether by foreign tourists in Cuba or upon Cubans enjoying restaurants or hotels, would generate much government revenue. A special sales tax on tourism could be subject to fraud and abuse since it would not include the “self-enforcing” mechanisms that the VAT has. At the same time, no tax holidays are proposed here for any sector, including the tourism sector. Some policy makers might be hopeful that the most dynamic sector of the economy should produce special tax revenues. This is discouraged since while tourism is currently very dynamic, abuse of by tax authorities could slay this golden goose. Although Cubans have had access to rather good social services provided by the state, consensus seems to be that these services have declined substantially during the 1990s. The fiscal costs of continuing to provide social services, even at these now reduced levels, will be quite burdensome for the transition government. New means of providing and financing these services would have to be investigated. The dilapidation of the country’s housing stock and economic infrastructure will likely be given quite a boost from foreign aid during the transition process. Nonetheless, this is an important issue of transition. Decisions must be made as to who will be responsible for producing housing and other infrastructure, what will be the precise role of the state in these two sectors, and what financing mechanisms will need to be developed to ensure their sustainability. Remaining restrictions on self-employment need to be removed at the outset of transition. Self-employment is likely to be a major motor for economic growth and an important mechanism for absorbing redundant labor let go from the industrial and government sectors. Maintaining present restrictions on self-employment will absolutely choke the transition process. Tanzi (1999) discusses the importance of institutional development and the performance of the tax system. Gallagher (1998) also discusses a number of changes in the way ministries of finance need to change as they move from centrally-planned economies to free-market economies. This has not been the focus of this paper, but overall management of the public finances will need to be reformed and tax administration capabilities will need to be strengthened and made consistent with the concepts of efficient public administration and the realities of free-market economics and the confusing new environment this will create. Legal and regulatory frameworks will be needed to establish taxes, define terms, guarantee rights, delineate responsibilities and provide the tax administration with the legal tools it will need to enforce a coercive tax system. An appeal system and courts with tax jurisdiction will be required. A transitional tax system can be developed while these institutional arrangements are being developed. 1. I would like to thank Jorge Sanguinetty, Julieta Valls-Breto, and René Costales for their comments on earlier versions of this paper. Of course, any errors or misjudgments are attributable only to myself. 2. Although Cuba “reformed” its tax system a few years ago, no analysis has been provided to indicate that this set of reforms can be added to or altered completely to ensure an adequate system during the transition stage. 3. Issues of intergovernmental fiscal relations and local government development are not treated in this paper, but would remain for future work. 4. Hernández-Catá (1999) is optimistic about Cuba’s trade prospects with the U.S. as a neighbor. 5. See Table 1 in Werlau (1996). 6. See Salvatore (1983, pp. 191-205) for a complete discussion and derivations of the rate of effective protection. 7. For a discussion of how tax policies, rates, and tax administration affect the true efficiency and progressiveness of a tax system, see Gallagher (1995). 8. Travieso-Díaz and Ferraté (1997) point out that privatized state enterprises should not be subjected to “double taxation,” but they do not explain what they mean by this. 9. See Parthasarathi (1999) for a very interesting discussion of future prospects for taxation in Latin America.